A private organization built an experiment a few miles north of Tuscon (Arizona). The structure is an "earth-like" system to sustain life and constructs in a size small enough to be put into space. In 1990, Universal Wallboard completed the unique internal habitat structure. This is a three story metal framed free-standing structure which is completely independent of the outer structural skin. 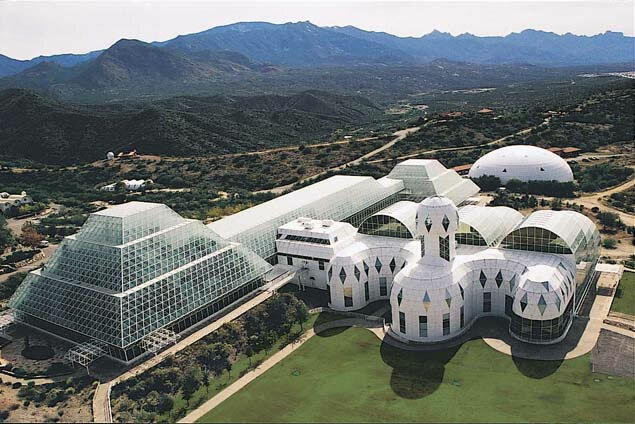 Biosphere2 begins with eight persons . Today it is a place for scientists, students and engineers to learn how the biological diversity of the planet's ecosystems sustain life.